The Big Bang Theory star Kaley Cuoco recently included her dog in her wedding (adorable, we know) –which inspired us to join in on the puppy love and explore ways to involve your pooch in your big day! As weddings usually consist of family and friends, you don’t want your furry companion to feel left out; after all they’re family too. 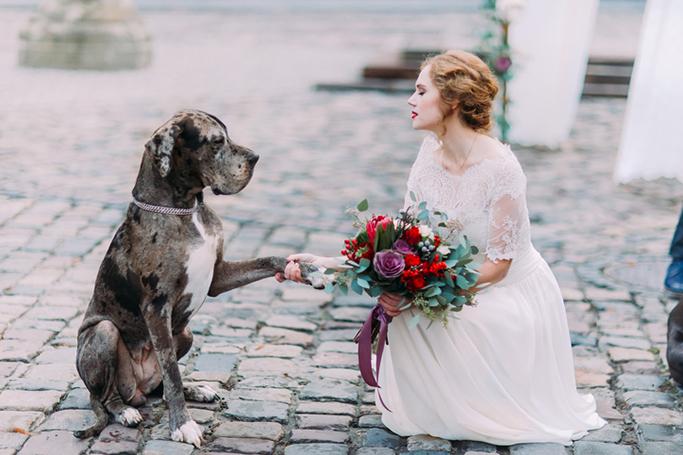 Therefore, a pet can be the perfect guest at your wedding ceremony, with a starring role such as a ring bearer (if you’re brave enough), or a fluffy flower girl! But don’t worry if your venue won’t allow pets or your dog is too shy or temperamental to attend, as we’ve also got alternative ways to involve the dog in your wedding. From proposal announcements to cake toppers, there are plenty of ways to honour your dog on your special day, without dressing them in a tux or tutu (as cute as it is). As much as we love the ideas of dogs at weddings, it is important to note that your pet must comfortable, safe and attended at all times, to ensure your dog is happy and no wedding disasters occur! We advise you also inform your guests of your doggy’s presence, just in case anyone is allergic or afraid.